We’d love your help. Let us know what’s wrong with this preview of Tin by Pádraig Kenny. In an alternative England of the 1930s where the laws of mechanics govern even the most talented engineers, a mismatch In this gripping, imaginative, and hilarious adventure -- comprised of an unforgettable crew of misfits -- a boy and his mechanical friends discover the truth about his past. To ask other readers questions about Tin, please sign up. Do you know Adam blade in our life?!? As a long-term reader of the Oz books, I was intrigued by the title and cover of Padraig Kenny’s Tin. I’m always curious about British responses to Oz: an all-American classic, too often known only as a musical that emphasises on staying in your own backyard. On first opening Kenny’s novel, though, we might think references to Asimov would be more appropriate than L. Frank Baum. Here is a set of rules on preserving the distinction between “mechanicals” and “proper humans”, and the mysterious ter As a long-term reader of the Oz books, I was intrigued by the title and cover of Padraig Kenny’s Tin. I’m always curious about British responses to Oz: an all-American classic, too often known only as a musical that emphasises on staying in your own backyard. On first opening Kenny’s novel, though, we might think references to Asimov would be more appropriate than L. Frank Baum. Here is a set of rules on preserving the distinction between “mechanicals” and “proper humans”, and the mysterious term “ensoulment”. We’re soon in the company of proper humans and mechanicals, as young Christopher accompanies Mr Absalom – engineer, salesman and chancer – on an increasingly macabre bit of doorstep sales. Would these grieving parents like to replace their lost son with a clockwork model called Jack? The temptation, Christopher sees, is there in the eyes of Absalom’s prospective clients, even if the final answer in this case is an angry door slam. For the time being, however, we still seem to be more in a Tim Burtonesque take on Blade Runner than the fairy tale escapism of Baum’s Wizard. The titular reference to the Tin Woodsman becomes clearer in a few chapter’s time, when Christopher discovers he is more mechanical than mortal, albeit the work of a genius engineer. But where do his happy memories of family come from? What parts of his life are fabricated? Could he possibly have had a human existence before this one? As the novel develops, we learn that this is a world of tangible, retrievable, transferable souls – and that mechanical robots like Christopher, Jack or the Scarecrow-esque Round Rob are humanoid in other ways than their physical appearance. Adventure ensues. Children’s literature is the long-established home of philosophical exploration, from the Red King’s dream in Lewis Carroll, to that Tin Man’s transition from meat to metal. There is an abundance of food for thought in Christopher’s predicament: questions of identity, memory, humanity, even reincarnation (the Tin Man being a distraction from otherwise blatant religious iconography). A tight plot prevents the whole from becoming ponderously heavy with such weighty topics – too much so, in my opinion. The narrative concerning Christopher’s rescue is busy with shouting and running about, which is essentially just exposition delivered at volume. When both plot strands converge in a confrontation with a diabolical mastermind, philosophical enquiry is furiously boiled down to a few moralistic homilies and a sickly sweet happy ending. The novel rests between science-fiction (a culture dependent on robots) and fantasy (robots that move and develop character entirely by magic). There is complacency in this vagueness of ideas: the history of robots in literature stretches back to satires of worker exploitation, whilst magic servants have their own Golem-ish connotations. Kenny’s rollicking action means the reader’s attention is fixed on the present: we are never invited to query the actions of his creator, or what future he can look toward as essentially immortal. It was a lovely read and I loved how the robots all seemed so human. It’s a really nice and easy read! The ending was so so lovely too! It finished it off nicely! It's a children's book and I read it as such. I mostly read adult fantasy/Sci-fi, O was not looking at it from that perspective. This was a wonderful story. I fell in love with the characters and world they belong to. I am so glad the shop assistant recommended this little treasure to me. I know it's one I will read again and again. It made me cry at the end (in a good way) , and that's all you need to know. This book centers on a group of mechanicals who set out to rescue one of there own who isn't all he seems. It's about the lengths friends will go to to help no matter the differences. This book throws you straight in to the story and in the opening chapters we meet Christopher, Jack, round Rob, Manda and Gripper. When Christopher is taken after its discovered he's not a proper boy, his friends set out to find his creator and get him back. What follows is a series of little adventu What a fun book. What follows is a series of little adventures and some truths been revealed about who Christopher is. I really enjoyed this book, it had such innocence to it. A group of friends helping each other no matter their differences. The characters were well written and all played their parts perfectly. I liked that the story got going straight away, with no lengthy descriptions. The world building was enough to allow me to see the world created. One of the finest children's books I've read in a very long time, Tin was a marvellous, moving exploration of what makes us human (can we really be sure? ), the nature of war, the morality of genius, and the profound power of love and friendship. Beautifully written and evocatively described, with a cast of distinct characters both human and mechanical, this is a book to treasure. 3.5 stars. One of this year's Red Dot books. Good amount of action inbetween the quest scenes. I feel that the "characters" were never really fully developed, but rather pastiches of 'types'. I would have liked to have Estelle have more of a role instead of just the smoldering resentful female. The whole book I felt that it had been written with transferring to a screen play in mind and that was somewhat disconcerting. A few interesting 'big themes' about what it is to be human, what it is to ha 3.5 stars. One of this year's Red Dot books. Good amount of action inbetween the quest scenes. I feel that the "characters" were never really fully developed, but rather pastiches of 'types'. I would have liked to have Estelle have more of a role instead of just the smoldering resentful female. The whole book I felt that it had been written with transferring to a screen play in mind and that was somewhat disconcerting. Started on a whim as it's our children's book of the month and I thought I could get some clues as to what it's like. Cut to give hours later and I'm sobbing, curled up on my chair is desperate need of a wee and something to eat and drink. Such a great friendship, journey book. Loved all the characters, especially Manda, Round Robbie and Gripper. Tin is one of my most favourite books. It is about an adventure where a few robot friends go on a mission to save their "kind of real" friend. It is quite emotional as they face many difficulties along the way but they stay strong and continue. It shows how strong friendship can be, even if it is between robots. I highly recommend you purchase this book; I am sure you will not regret it. I love Tin because of all the characters and their personalities. A few are extremely grumpy, stubborn people (or mechanicals) like Cormier, and some are optimistic - like Rob! Padraig use a variety of vocabulary to describe different objects and how someone feels, "A rush of anger flooded into him." Everything is so detailed and interesting, each chapter is shocking and are very important. I love the way it switches from Jack's point of view to Christopher's; it meant that you had to keep reading to find out what happened next, where the previous chapter ended. At that start, nearly all the people reading this brilliant book thought that Mr Absalom was the main protagonist as it talks about him a lot. The beginning of the book is set at a door-step and Absalom tried to sell Jack. I think the ending is very touching. Tin is a strange word to name the book, but that is what makes this book so unique and eye-catching. I suggest that you buy it, if you love action and well-presented books that hook you in straight away. I think that Tin the book, which was written by Padraig Kenny, is an amazing book which uses lots of authorial techniques and technical vocabulary. I thought that Padraig Kenny has done a really good job of writing this book and I would like to say well done for what you have achieved by writing it! I also like the fact that he made the title of the book only three letters, and that makes the reader want to read on. Lastly, I rate this book 5 out of 5 stars! We first meet Christopher, a “proper human”, and his ragtag group of mechanical friends as they work alongside their creator, Mr. Absalom. We learn that Absalom is not a licensed engineer, and has in fact been hiding a secret- that Christopher is a mechanical, too, of a very special sort- one that has been “ensouled” and given life by Refined Propulsion. This is outlawed and Christopher is taken away by the Agency. His friends, Jack, Round Rob, Estelle, Manda, and Gripper go searching for their friend. These robots have so much life and feeling that you will find yourself empathizing and cheering them on as they battle their way to Christopher. What it means to be human - children's story about robots. Intriguing and exciting story in the vein of I Robot, A.I. and The Wizard of Oz. In this world, there are robotic laws to control the mechanoids created by humans, one of which is that these creations are only allowed to be child-sized. With Absalom, a sub-par engineer, a group of mechanicals eke out a living, having bonded together as friends. The disparate group contains the usual mix of personalities, and includes a 'real boy', a 'prope What it means to be human - children's story about robots. With Absalom, a sub-par engineer, a group of mechanicals eke out a living, having bonded together as friends. The disparate group contains the usual mix of personalities, and includes a 'real boy', a 'proper' called Christopher who barely remembers the fire that orphaned him. I loved the group of mechanicals, such a loveable bunch of misfits, quirky and very close-knit. The whole idea of robotic children is a rather enthralling concept, and the action moves quickly to a rather thrilling denouement. I'm not really a fan of this book. For me it was just too young for me. The main characters are a group of mechanicals; Christopher, Jack, round Rob, Manda and Gripper. When Christopher goes missing the rest go off on an adventure to find him. I also thought it might be more to do with the wizard of Oz due to the title and cover picture but instead it was more futuristic (mechanical people). There few secondary characters because there are so many main characters. The storyline is OK but it was I'm not really a fan of this book. For me it was just too young for me. The storyline is OK but it was aimed at a much younger audience so it wasn't all that exciting for me to read. The pacing is good but again it was not so exciting for me to read. This was an endearing story about friendship, family, and discovery of who you are. We follow a group of friends from the beginning, all precious in their way, and there journey to find a friend and discover themselves. Bad guys are afoot and the nefarious plan needs to be stopped. When Christopher is taken, his friends go out to find him and recruit help along the way. We are transported to a world where mechanical beings are brought to life and see what that world may look like and/or how they This was an endearing story about friendship, family, and discovery of who you are. When Christopher is taken, his friends go out to find him and recruit help along the way. We are transported to a world where mechanical beings are brought to life and see what that world may look like and/or how they react/restrict. This review has been hidden because it contains spoilers. To view it, click here. That's the most traumatising end I've read for a villain in a children's book for a long time. I certainly wasn't expecting a literal version of 'I have no mouth and yet I must scream' in a fun fantasy kids book about robots but here we are. I'd be fascinated to see the broader world at play here, because the hints are tantalising and the themes briefly engaged with would certainly be a neat exploration if more thoroughly developed, but for what it is, I wouldn't fault it. My homework for this month, I really enjoyed this and don't mind admitting I had a wee lump in my throat at the end. Orphan boy Christopher saves one of his scrap-metal buddies from being hit by a car and an awful truth is revealed. When men claiming to be from the Agency arrive and arrest Christopher, his friends come up with a plan to bring him home. As the book says, it's an adventure of discovery of who and what they are. A terrific Wizard of Oz type of adventure filled with human & metal characters. Like an episode of Robot Wars, but with heart. There is "no nobler thing in the world to do than to create and to take care of precious things." Beautifully written, too. This book has a pretty powerful - think so tears could be shed by many a reader. This book is an interesting story about man and machine and the risk of playing God. It reflects the world we live in but at its heart it has some powerful messages about family, friends and the power of memory too. A lovely little book! Such a heartwarming story. Kenny's strong characterisation is definitely what makes this book. A wonderful adventure full of hope and friendship, set in an alternate Britain. I found myself pulled in to a world where The Wizard of Oz meets the kids film Robots, it was wonderful. 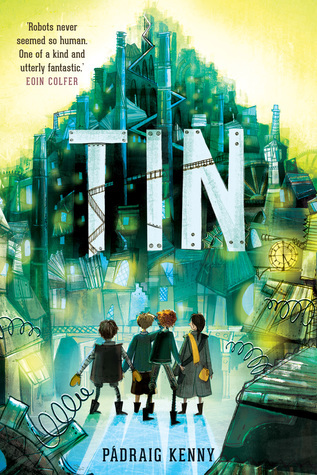 Tin by Padraig Kenny is about Christopher, a ‘proper’ orphan who is the only real boy in a group of mechanical children who work for Mr Absalom the engineer. An accident reveals an astonishing truth which leads the friends on an adventure full of danger. I adored this book!! I couldn’t put it down from the minute I started and read it in one evening because I stayed up waaaay too late devouring it. The ‘This Book in Three Words’ bubble that Chicken House publishing put on the back of their kids Tin by Padraig Kenny is about Christopher, a ‘proper’ orphan who is the only real boy in a group of mechanical children who work for Mr Absalom the engineer. An accident reveals an astonishing truth which leads the friends on an adventure full of danger. I adored this book!! I couldn’t put it down from the minute I started and read it in one evening because I stayed up waaaay too late devouring it. The ‘This Book in Three Words’ bubble that Chicken House publishing put on the back of their kids books has Friendship, Heart and Quest and it is just so accurate! The main character Christopher is an orphan working for Mr Absalom the engineer and his friends are 4 of Mr Absalom’s creations - mechanical children named Jack, Rob, Manda and Gripper. Another friend is the skin maker Estelle who is a ‘proper’ or real human child. I really don’t want to go into too much detail about the storyline as I am scared to spoil it for future readers but when Christopher is separated from the rest of his friends they go on a journey to rescue him and it’s not always an easy one. The humans in this story are all so angry, and hurt, a lot of the time, and it’s so interesting to see this portrayed against the naivety and simple logic of the mechanical children. But the mechanical children learn a lot about what makes humans human along the way and also teach the humans an awful lot about themselves at the same time. Christopher is 'Proper': a real boy with soul. Since becoming an orphan, he works for an engineer who creates mechanicals. Then disaster strikes and an accident unveils a secret which changes Christopher's life forever. Before long, Christopher is in danger and needs his mechanical family to save him. The idea of mechanicals living in a human world is not a new one. You need only think of Asimov's works of The Wizard of Oz to see this - there are many subtle references to Oz in Tin. More recently Christopher is 'Proper': a real boy with soul. Since becoming an orphan, he works for an engineer who creates mechanicals. Then disaster strikes and an accident unveils a secret which changes Christopher's life forever. Before long, Christopher is in danger and needs his mechanical family to save him. The idea of mechanicals living in a human world is not a new one. You need only think of Asimov's works of The Wizard of Oz to see this - there are many subtle references to Oz in Tin. More recently, books like Peter Bunzl's Cogheart books have introduced the concept to a newer generation. It is also a topic that has always interested me. As a result, Tin was a book that I'd very much been looking forward to. Early on, the narrative is split between Christopher's ordeal and his friend's mission to save him. This is where some of the mechanical characters come into their own. Each has their own quirky personality, which at some point is key to the story. It's a bit like the Wizard of Oz in a way. All in all, it's a straight forward adventure based around the theme of friendship. The mechanicals bring an added dimension and allow the reader to question what it is to be human after all. For some reason, the book didn't live up to my expectations. I finished the book a couple of weeks ago and have been mulling over this review since. On the surface everything is there: a unique cast of characters, an intriguing adventure, interesting use of language. In the end it boils down to two things. Firstly, I didn't believe in some of the characters. Try as I might, I never felt that emotional attachment with Christopher. Neither did I with quite a few of his mechanical friends. Secondly, the world seemed undeveloped and left me with a niggling feeling. The question I have asked myself for the last few days is whether these niggles are mine alone or would they stand out to children? The solution was to ask a child. Their opinion was that they liked some of the characters but that there were too many. On the other hand, unlike me they thought the whole setting was well-created. The telling comment was that Tin 'wasn't as good as Cogheart and Moonlocket', but would probably appeal to boys who like adventures. The test of time will be how other children react as more read it. It's clear that this is a book that will work for children on different levels. Some will see it as a pure adventure; others will look deeper at the underlying themes. Without a doubt, there are children who will lap up this book, but I do feel it won't be everyone's cup of tea. As for me, I've promised myself that I will read the book again in a few months. Perhaps I've looked at it with too critical an eye, or perhaps this wasn't the book for me. A fast-paced story centring around Christopher, a boy who lives with mechanicals - sentient robots, essentially. When Christopher finds out something shocking about his past, he and his friends set off to discover the truth, leading to whirlwind encounters with deranged inventors and power-hungry control freaks. The language here is rich and absorbing, every line used to develop each character fully and further storylines to such an extent that they could have their own stories. Round Rob was a A fast-paced story centring around Christopher, a boy who lives with mechanicals - sentient robots, essentially. The language here is rich and absorbing, every line used to develop each character fully and further storylines to such an extent that they could have their own stories. Round Rob was a particular favourite of mine, but Cormier grew on me too as his own backstory was revealed. This book had some really great components to it and I certainly enjoyed it, but sadly, not as much as I thought I was going to. It reminded me of so many other stories. There were elements of Oliver Twist, Astro Boy, Casshern Sins (anime) and of course the Wizard of Oz, but I liked that as I don't feel that the author copied any of these stories, more so used them as inspiration. The concept of mechanicals was smart as it merged science fiction with magic and Round Rob was a really great charact This book had some really great components to it and I certainly enjoyed it, but sadly, not as much as I thought I was going to. It reminded me of so many other stories. There were elements of Oliver Twist, Astro Boy, Casshern Sins (anime) and of course the Wizard of Oz, but I liked that as I don't feel that the author copied any of these stories, more so used them as inspiration. The concept of mechanicals was smart as it merged science fiction with magic and Round Rob was a really great character and I loved his cluelessness and charming over-confidence. Sadly the plot let the book down a little as I really didn't feel there was a lot there and what was there was predictable and very well-trodden in MG plot terms. Also, I struggled to differentiate between Christopher and Jack who, despite the obvious differences, felt the same in term of character. This was especially confusing when the POV changed from one to the other as i didn't get the sense that it was a different person we were following. That said, not everyone is like me and I'm probably unusual in enjoying MG books with complex plots. I can imagine this book being quite popular with 8-10 year olds and, while Estelle is a strong female character (if a tad shallow) I think this book would probably appeal to boys more than girls. Follow the ragtag band of mechanicals as they search for Christopher, who has been abducted by someone who wants to discover his deepest secrets. Throughout this gripping adventure, set in an England of alternative 1930s where mechanicals (robots) are common, there is a huge nod to ‘The Wizard of Oz’, a curmodgeonly wizard, evil witch, someone longing for home, and a ragtag band of friends who are on their own journeys of discovery. Pádraig has developed a wonderfully believable world where Pinocc Follow the ragtag band of mechanicals as they search for Christopher, who has been abducted by someone who wants to discover his deepest secrets. Pádraig has developed a wonderfully believable world where Pinocchio was burnt on a bonfire through fear, but Gepetto (Runcible) kept developing his creations, perfecting them, but there was always fear. Therefore a set of rules were developed to make the mechanicals acceptable. The pace is perfect and keeps you on the edge of your seat throughout, always one step ahead of you keeping you wanting more. This is accompanied by some of the best described locations ever, some of which are very dark indeed. It feels like the start of a new fictional universe which I would be more than happy to explore further. Charming adventure that becomes quite action-packed towards the end. #Kidlit Exchange #Partner - Thank you Kidlit Exchange and Scholastic, with a little help from Pádraig Kenny, for the ARC of Middle-Grade steampunk/sci-fi TIN. It’s somewhere between WW1 and WW2 in alternate history England, and robotics engineers and their creations are governed by The Agency, a shadowy and authoritarian government entity. They have to be: Robots can be made to resemble humans, and technology exists to ensoul them. While eleven-year-old Christopher remembers his time at the orph #Kidlit Exchange #Partner - Thank you Kidlit Exchange and Scholastic, with a little help from Pádraig Kenny, for the ARC of Middle-Grade steampunk/sci-fi TIN. While eleven-year-old Christopher remembers his time at the orphanage fondly, he is happy to be the only “Proper” boy among his robot friends in Mr. Absalom’s junkyard. The slimy inventor may be loathsome and unlicensed, but he has built a group of robots who with Christopher, form an unbreakable squad: Round Rob, The Gripper, Jack, and Manda. Then one day a routine little-boy misadventure reveals the truth: Christopher is a robot himself. Worse, he’s the most illegal kind: Made to look exactly like a human and… could he possibly be infused with a real human soul? The back cover of the book helpfully points the reader to the specific page of this earth-shattering part. In case you needed any further urging to read TIN, just turn straight to the (first) mind-blowingly cool part. When The Agency raids the junkyard, arrests Absalom, and kidnaps Christopher, his robot family is devastated and teams up with undercover preteen female mechanic Estelle (on the run from an abusive human father) to rush to his rescue. Rescue can only come from reclusive mechanical genius Philip Cormier, whose legendary and highly illegal Diviner can rescue souls from the Afterwards and infuse them with robots through psychonic adhesion. But why is the reclusive Cormier so hostile toward “Flesh”? More importantly… why does he have a picture of Christopher in his house? TIN presents a lot of twists and turns rooted in complex moral questions. Namely, bad-guy Blake is one of the more complex antagonists I’ve seen in Middle Grade. His dramatic defeat doesn’t wrap everything up with a happy ending, but rather makes the reader reflect whether it’s wrong to bring your loved ones back if you can. While throughout the book, the humans insist that robots have no feelings, empathy or compassion… just below TIN’s action-packed surface, it’s easy to see that the robots are the only ones who consistently display these qualities. TIN is half steampunk, half science fiction, and all heart. Perhaps it’s the US cover, reminiscent of Emerald City, but there are a lot of the same undertones as Wizard of Oz (just grittier). Give to fans of Peter Bunzl’s COGHEART or Jonathan Auxier’s SWEEP , probably with a hug and some tissues. Also, give to a writer looking for a great mentor text for a multi-layered and morally complex backstory. "When I first decided to read this book I expected it to be a twee little story about an orphaned boy and his little robot friends going on an adventure. What I actually got was something much deeper that goes into the finer details of what it means to be human. This feels like an incredibly grown-up book and it was an absolute joy to read. Writer Pádraig Kenny has not only come up with a fantastic concept for his story but he has fit it into a really well-built world. His whole new reality has its own, slightly recognisable, history and is full of luscious details. It is a steam punk wonderland that I wish I could have seen more of. He has also crammed it full of amazingly written characters who feel believably real despite the fact many of them are actually artificial. Each mechanical has their own distinct personality and add their own emotional slant to the narrative. It’s a pleasure getting to know these characters and it’s super difficult to not fall in love with each of them. I admit that I wasn’t expecting a children’s book to have such a profound impact on me, a nearly 30-year-old woman, but there were moments when I was nearly in bits. The story delves deep into the heart of humanity and love and is not afraid to put its readers through the ringer. The narrative gets a little dark in places but is always so full of hope and love that it never becomes too much. It plays with the idea that science and advancement are great but that there is a massive responsibility to keep it under control for the good of humanity. Genius is all well and good but nobody should be trying to play God. It’s an incredibly mature and thoughtful book that I wish I’d read as a child. There are big ideas and big, gut-wrenching feelings inside these pages but there is also more than enough fun, laughter, and love to balance it out. Christopher is an orphan boy who works for Mr. Absalom, an engineer who creates mechanicals, a 1930s version of robots. These mechanicals are not perfect, and are all children, according to the English laws of the time. The group ekes out an existence, doing work and repairs for income. Mr. Absalom even tries to sell one of his works, Jack, but that falls through. When Christopher is injured, the truth is revealed-- he is not human, but mechanical like his friends. Not only that, but he is of such high quality that it is suspected he is the work of Philip Cormier, an engineer who produced excellent work but who fell into disrepute when his work on war machines with Blake went badly wrong. The inspectors come and remove Christopher to the care of Blake's son, and Mr. Absalom's mechanicals are ordered to be deconstructed. Instead, they run away to find Cormier, who can claim Christopher as his own work. They find Cormier in a community of damaged mechanicals, and manage to convince him to help. This involves breaking into the agency that oversees mechanicals and stealing the Diviner, a device that can locate separate units. They track Christopher down, but Blake's son wants to continue his father's work, which included "ensouling" mechanicals, which is illegal. There is an epic fight between Blake's creations and Absalom's group of friends, who are sorely outnumbered. With determination, grit, and Cormier's help, can they win their freedom? Strengths: The world building in this was very good, and the post WWI setting was different and effective. I loved that WWI served as a motivation for much of the mechanicals' roles. The characters are all well developed and distinct, and get along in a very charming way. Estelle, as the lone human, is understanding of the plight of her friends. Cormier is excellent, and Blake is disturbing. There are lots of twists that kept me turning the pages. Weaknesses: I love a good battle with machines imbued with the souls of rats and lots of crunching of steel machinery, but the inclusion caught me by surprise. Blake was more evil than I expected, and this took a dark, dark turn. Granted, I adore the kind of nasty, vindictive revenge Estelle exacts on Blake, but it was a little unexpected.